Scenario It is a sunny day and Justin wants to leave the house and do something fun. He grabs his keys and goes to his car in the garage. However, he soon realizes that his car is gone – probably a family member took it for the day. He goes to the bus stop and waits for the bus. Checking One-Bus-Away, he sees that there will be no more departures in the next hour or so. He then gets a great idea to take Lyft as an alternative. Opening the app, he requests a Lyft and is soon on his way. 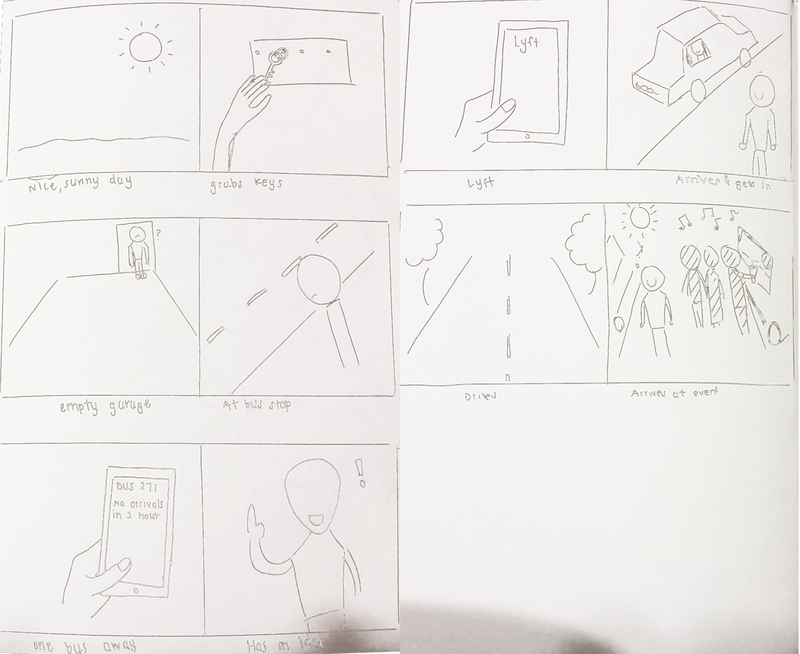 Storyboards I wanted to make my demo video simple with no subtitles or voice overlays. My storyboard sketch is below. Analysis After our in-class critique, I found that my peers did not realize that Justin went to the garage to check if his car was there or not. They just thought that he was leaving the house. They suggested that I cut this scene out completely and just start from the bus stop. Even though they did not realize my intent for the first scene, the overall video still conveyed the message and motivation to use Lyft. They liked my choice of music because it was subtle and not distracting. Also, they thought it was nice that at the end I showed the fun event that Justin was aiming to go to. The angles were good and views of the screen were clear and effective.